Inspired by Darwin, Amy Stewart takes us on a subterranean adventure. 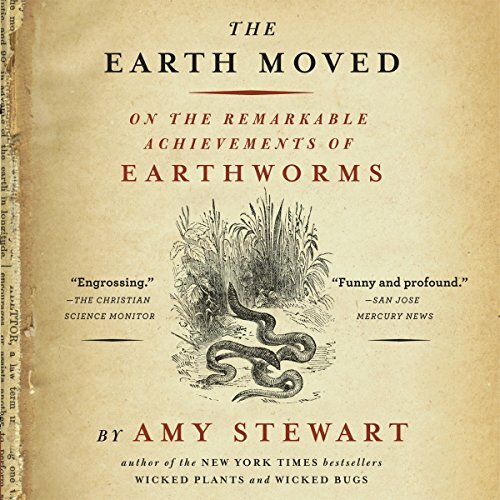 Witty, offbeat, charming, and ever curious, she unearths the complex web of life beneath our feet and investigates the role earthworms play in cutting-edge science—from toxic cleanups to the study of regeneration. Would you consider the audio edition of Earth Moved to be better than the print version? I am not sure because I have not see the print version. What was one of the most memorable moments of Earth Moved? Being an organic gardener with an interest in looking at the garden as whole. I found the info about the worms lives and different types of worms very interesting. I did listen to it in all one sitting. Mostly because I listen to most books that way. It was by no means a page turner, but it was interesting. I would recommend this book to any gardener. I have read wicked plants, wicked bugs, and the drunken botanist. Out of all the Amy Stewart books I have read this was my favorite. The information is helpful and interesting. It also tends to turn away from her normal writing style which often sounds like she just took an encyclopedia and reworked it into her own book. This book gives you some more hands on info and a diverse look at the different kinds of worms and how they make an impact on various environments. Yes, it's s book about earthworms. I thought I knew a lot about these little creatures, and now know that I didn't know the half of it! There is history, how-to, trivia, and even villainy in this book. A delightful, educational, light listen! Your Pals May Tire Of Hearing Worm Facts From You. What made the experience of listening to Earth Moved the most enjoyable? I bought this book on a whim (Audible Daily Deal) and it managed to give me a case of worms-on-the-brain. I found myself sharing random fascinating facts about worms throughout the day with anyone who would listen. The author really captures your imagination by describing the world underground from a "worm's eye view" and delivers a bunch of fairly mind-blowing facts. The book never gets boring, steadily moving along from one worm-related area of interest to another. It also never gets very deep or scientific, but I'm okay with that. Fascinating little book. A nice between-serious history (or long novels) books type of volume. You will learn alot about a peculiar corner of the wild world, that is about worms, the science of worms (what little is known on the subject). It is not a gross exposition. The writer and the narrator combine to make the book interesting. Would you listen to Earth Moved again? Why? I would absolutely listen to this again. It's absolutely fascinating. I have learned a lot and have a new perspective on worms! The story was very personal so I felt connected to the author, Darwin, and the other people (including the worm people and by that I mean worms as people). Considering I have ADHD and it's hard for me to sit still I didn't want to leave or stop the book because it was presented in this way. It was all very fascinating although I did enjoy hearing about Darwin and the Authors love of the worm. This book made me extremely happy. I'm glad I'm not the only animal nut. I say animal nut because it is hard to find people who think about animals on this level. I appreciated the extreme consideration and detail to attention given to the worm in this book. There is a lot of beneficial information and a good perspective given on the worm. It takes someone who has spent a lot of time on a subject and has a passion for understanding the intercate details. The author did an absolutely amazing job of showing me both. This makes me confident the knowledge she is passing on is well informed and has nothing but the best intentions. This is not to mention I spent some time looking up facts for myself. What did you love best about Earth Moved? The information on how the earthworms help us, as well as the problems that they can cause. I hungered for more, but was satisfied with what i got. The emotion that can be conveyed from another person's understanding of what is written. This book was worth listening to, and mostly kept me engaged, though at times it felt like more sentiment than science. I already find the subject interesting and worth delving into without the author having to try to wax poetic and quote Shakespeare. I could've done without the long asides about her experience in her backyard garden too, though I imagine gardeners would find those bits pleasant. At the end of her chapter on worms relating to agricultural science she says something like, "Really I'm not interested in charts and graphs, but in trial-and-error!" Which is fine, but then you really shouldn't go around making sweeping scientific claims like "organic produce has more nutrients than conventional produce". Maybe you should look at just a few charts and graphs before speaking on that one. Besides, what are charts and graphs but a whole bunch of aggregated trial-and-error data? She does speak with a lot of scientists, though, and overall I liked the book and I learned things I didn't know. I might've liked it a little more with a different narrator. This one sounded like she was trying to sell me something. More like a narrator from the self-help section doing pop science. wow, worms! don't hide your light under a bushel! I never knew just how ecologically important earthworms are. Never knew they were a special favorite of Darwin's. Did not know they are becoming an important tool in research and in biohazard cleanup. All hail these lowly worms! they are really pretty cool and interesting. The author also gives all the advice you would need to start ypur own wormy compost box. Nerds, this is for us! A lovely review of college Agronomy and Helminths, with cool new stuff. Nonfiction makes me so happy!! I am so glad I discovered this book because I love books about quirky and unusual subjects, especially ones about our natural world. This was so charming and so personal and I learned so much about the earthworms that I struggle to save from puddles during my walks outside after a rain. I also learned about Darwin's interest in earthworms that I found fascinating. And although I draw the line about having my own worm bin, I truly appreciate those who do and I will certainly continue to save the worms from those puddles.